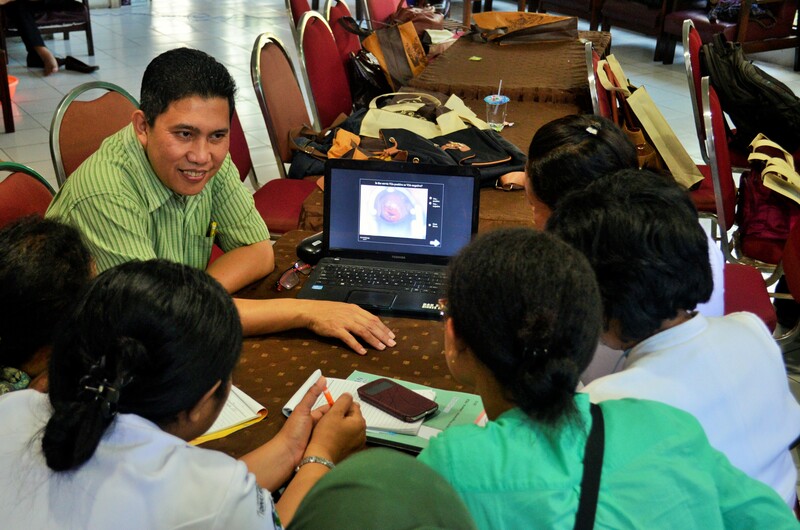 Since March this year the Female Cancer Program (FCP) Indonesia is working on the extension of their cervical cancer program to the island group Nusa Tenggara Timor, of which Flores – with his harbor city Ende – is part of. It all started with the establishment of the collaborating parties, like the government and medical facilities, who made official agreements concerning the cancer program. Recently the first FCP training was held in Ende city, which I joined. 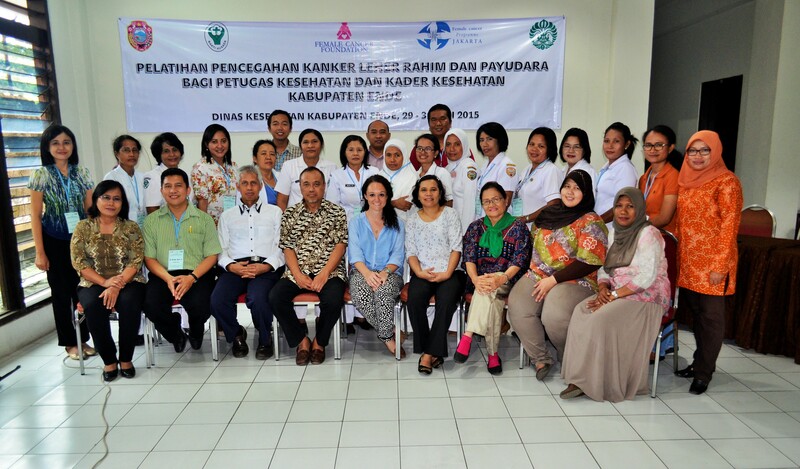 Prof. Andrijono and Dr. Gatot from the FCP Jakarta team, together with Dr. Unedo and Dr. Lidya from FCP Ende, gave a training course for doctors and midwives of different public health centers about the early detection of cervical cancer. 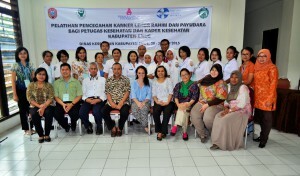 These doctors and midwives are the ones that will be the driven force to the See & Treat program in Ende. It is funny how day 1 of the training program already started with some Indonesian improvisation. I arrived with doctor Hani and midwife Tiur of the Jakarta team around 07.30 am at the location for the training, which was in a hotel congress room on the second floor. The registration of the trainees would start at 08.00 am already, so we were glad that the hotel employees already prepared the presentation equipment and room for at least 35 people. But, at 07.55 am it was decided that everything had to be moved to ground floor, because of the physical disability of one of the doctors to use the stairs. One significant point: there was no room on the ground floor, only a big lobby. In Indonesia everything is possible, so all the tables, chairs, equipment and installations of beamers and laptops were moved downstairs without any rush. Even big green cloths were taped on the windows to decrease the daily light shining into the lobby, to establish better view with the beamer. Meanwhile, the trainees already arrived and just waited patiently for one hour at least in the lobby seeing this active movement. Not to forget to mention the tourists that stayed in the hotel and walked around in the lobby, seeing us struggling to create a professional looking training area in a hotel lobby without privacy. A wonderful and typical Indonesian way of solving things and made me smile. 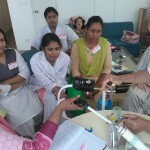 The training lasted 3 days, including theory about cervical cancer, screening, treatment, patient counseling and a workshop to get acquainted with Pap smear technique, VIA screening and cryotherapy. On the last day the trainees could practice everything that they learned on real patients, during their first See & Treat. This was held in the Public Health Office, in which five examination rooms were improvised. The rooms were all provided with the medical equipment needed and the special ‘ingredient’ for the VIA screening: acetic acid. Three of the fifty one women were screened VIA positive. This means that an early precancerous lesion is detected, which can be treated with cryotherapy. 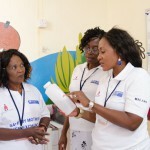 FCP offers this treatment directly, on the spot, which is called the single visit approach: women can be screened and treated during one single visit to the public health center. And next to that, all costs are covered. So in ideal setting, all the obstacles for the poor women to withdraw from a visit to the doctor are decreased to a minimum. This is the power of the See & Treat program. 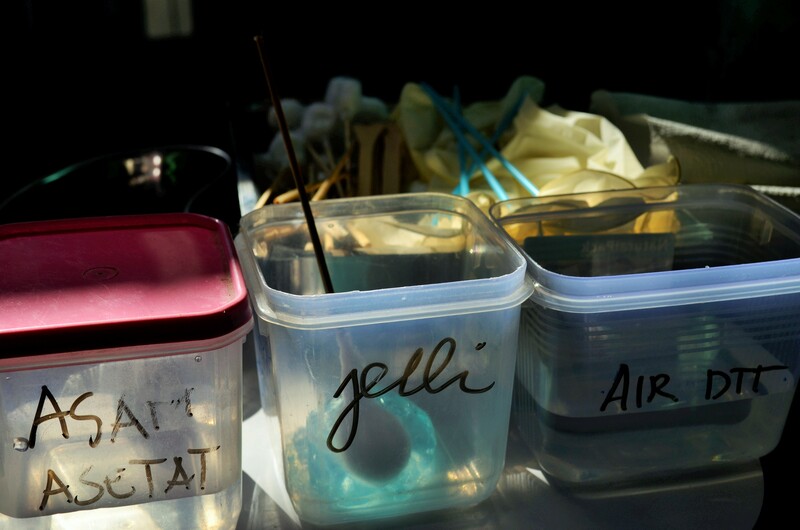 During the training the three positive screened women were directly treated with cryotherapy. A good learning moment for the trainees and a relief to the patients. They were very happy and grateful to get this opportunity. For me it was amazing to see the eagerness of the trainees to improve their knowledge and examination skills. But the most significant thing: the enthusiasm among the trainers and trainees, and the relaxed positive vibe, which is really important in the following activities and work environment of the FCP Ende and the sustainability of the program. For me as a Dutch doctor it is interesting to see how different the way of communication is with patients in Indonesia compared to Dutch patients. Here the doctor is still seen as the one who knows best and patients are not really keen to ask much questions. In the majority of the cases, they totally trust on the skills of the doctor, not doubting his expertise. In that there is a big difference with the Netherlands, where patients seem to become more defensive towards the doctors, doubting their skills and sometimes demand examinations. It is good to see that people in Indonesia respect each other and their specialization and fully trust on that; some people in the Netherlands can learn from that, to have more respect towards others and have a little bit more patience. On the other hand, people in the Netherlands should be happy with and aware of the freedom in speech they got and the openness in questioning the doctor, something from which Indonesia could maybe learn.